Could a flash of inspiration save the Gulf Coast states and sea life from the British Petroleum oil spill? Take a look at the six-minute YouTube video posted by the Walton County, Fla., Sheriff’s Department on its website. What looks like “a coupla good ole boys demonstrating how hay and straw could be used to pick up an oil spill” is actually Darryl Carpenter, Vice President of Florida-based CW Roberts Contracting and sub-contractor Otis Goodson stirring up a FIX for BP’s oil spill. Darryl Carpenter came up with the idea of using hay to soak up the oil spill from the ocean, while driving to a job site last Monday. The next minute he was on the phone with sub-contractor Goodson to ask: “Can you fill a large pan with water and oil, then grab a handful of hay and stir it in? Strain out the hay, then call me back and tell me what’s left in the pan. Eureka! Carpenter had found a solution. Goodson called back elated to say: “You’re not going to believe how this works!” The hay had soaked up all of the oil in the pan. The water looked clear again. The Walton County Sheriff’s real-time video confirms this. In a scene reminiscent of a primetime cooking show, the Carpenter and Goodson video shows how Coastal Bermuda and Bahia hay could be scattered over the surface of the ocean with hay blowers to absorb the oil. To start, the two men pour oil into two large pans of water, stir in the hay, add a little “wave action,” then skim off the oil-soaked hay. The audience watching the Walton County video included representatives from BP, the Coast Guard and the Sheriff’s office. CW Roberts then asks BP and the Coast Guard for the chance to do a 10-acre live demonstration in Gulf waters. They were told that approval has to come from higher up. Will it come in time? 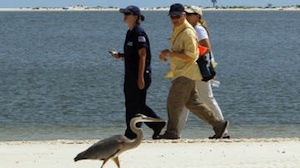 CW Roberts, a 700-employee contracting firm with headquarters in Tallahassee, Fla., and offices located all along the Gulf of Mexico from Destin to Fort Myers, is now under contract with the Walton County’s Office of Emergency Management to protect their beaches from the oil spill. A major component of their protection strategy is the use of bales of hay to keep the oil spill from reaching the Walton beaches. To jump start the process, the company is organizing another demonstration this Saturday morning to show how a hay blower and a conveyor can be put out on a boat to both distribute the hay, then pick it up. Shrimp boats can also be mobilized to pick it up with their nets, says Darryl Carpenter. In fact, the idea of mobilizing a statewide group of hay farmers, a fleet of shrimp boat owners, and a network of 700 CW Roberts employees to solve a problem of catastrophic proportions — that has challenged BP, the Coast Guard and the U.S. Government — may be just the type of heroism the Gulf Coast and America needs right now. This column also appeared on Alexia Parks’s blog on Huffington Post.